Welcome to Day 8 of a 12 day event to provide you with tons of Holiday-themed inspiration. We're making crafty projects using products we like and some of us are even offering prizes! 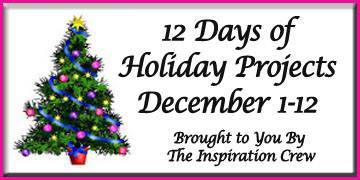 Check each blog for information about what prizes are being offered and when the winners will be announced on that blog. Last week, I resumed (after a two year hiatus) my role as Chair of Kate's school's School Council (Co-chair, this time, actually), which I had previously held for over 5 years. We had a big budget meeting last week and as a result of all the meetings to get everyone on board, I was a pretty constant presence in the school. This gave two teachers the opportunity to ask me for some cards. One asked me to make sets of thank you cards for 12 volunteers (they're getting 5 cards each due to lack of supplies on hand and I haven't started these yet - no worries, they're not due until Friday (eek!)). And the other asked me for 10 'wintery but not necessarily Christmas' cards for her own children to give to their teachers. 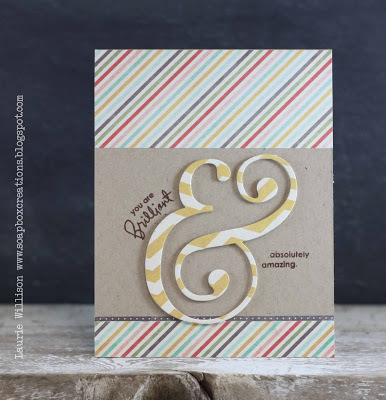 I was inspired by the intricate die cut and the slanted lines of the dp, as well as the small pops of red. I used a Simon Says Stamp snowflake and Stampin' Up DP. There is still time for you to play along! The deadline is Monday morning at 8am but if you can't play, don't forget you can still come back to vote from Monday morning to Tuesday morning at 8 am. What a fabulous card. 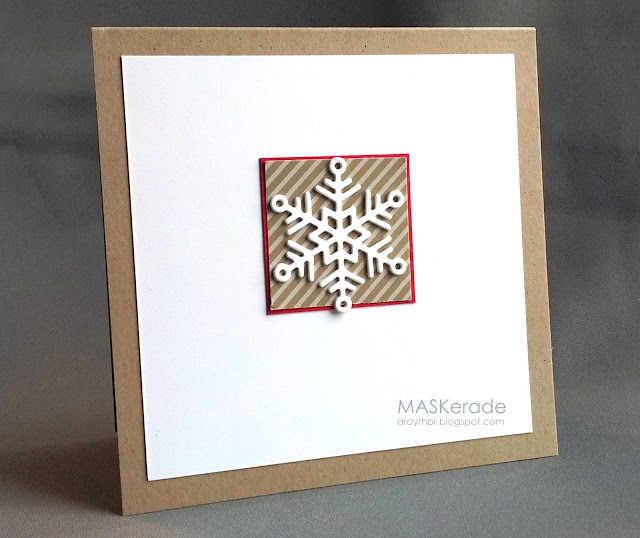 The white and kraft give it such a serene feeling, and that tiny bit of red packs a big punch. It's amazing how your small focal point makes such a big impact. The snowflake is beautifully framed. The white and kraft well together. I love your take on Laurie's inspiration card. The subtle square of stripes is gorgeous Ardyth! Fabulous card - and given your amazing talents, it's little wonder that your artistry is in demand! Have fun with your 'assignments' - they'll be gorgeous! Love this - the diagonal pp is perfect. Great take on the inspiration, Ardyth! I love the narrow red border, it really makes the snowflake pop. GORGEOUS! Kraft, red & white are meant for each other! Love the rich colors of this SU paper. Beautiful graphic design! 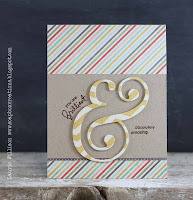 Great card - love the die cut. Gorgeous card!! Love how the snowflake really stands out! Love that the width of the lines in the snowflake are just about the same size as your background paper. I'm hopeful that at least you will make only one design for each order, or even for all the orders! Love this CAS beauty - just stunning!